I told you about the most-amazing-banana-chocolate-chip-muffins-ever-baked-on-the-face-of-the-earth right here, but in case you run out of bananas (or heaven forbid, chocolate! ), I devised a back-up muffin that is just as award-winning to my family as the original. Cranberry Almond Muffins. Plus the variation in fruit gives me a thumbs-up in the nutrition department. These cranberry almond muffins stem from my LOVE of fresh cranberries. I have only seen them in stores during Thanksgiving and that time frame is incredibly short – like only 3 weeks – so I buy them in bulk from Costco when I see them in early November, and then again right before Thanksgiving (not because I’ve eaten 3lbs of them, but because I can’t help myself). If they’re still there come December, please help me. Naturally, it doesn’t take many cranberries to make a wonderfully tart relish (which is apparently a condiment at the Thanksgiving table – as I learned this past holiday season – not a side dish as I had been raised to believe and enjoy) so I’m left with A LOT left over. That A LOT can be exponentially bigger depending on how many trips I made to Costco. 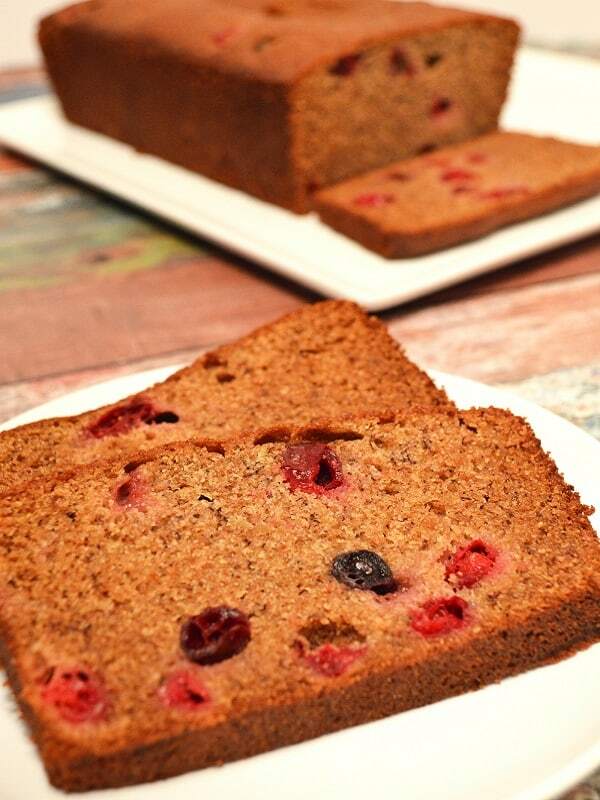 What to do with those cranberries? The freezer comes to the rescue again! Simple freeze the cranberries in a quart-size bag (I use multiple bags, of course) and you’re done! They go from freezer to recipe without needing to be thawed and since their outer skin is tougher than most berries, you can measure directly out of the bag without disrupting the others. If you don’t have any frozen cranberries, find yourself a friend who has plenty (ahem) and start baking! In a mixing bowl, cream sugar and butter. Add eggs, vanilla and almond milk until thoroughly blended. Add flours, baking soda and salt and mix until just combined. Spoon ¼ cup of batter into a muffin tin lined with paper cups. Bake at 350 degrees for about 30 minutes, or until the tops are dark golden brown. Cool for a few minutes before removing to a rack to cool completely. **Oat Flour: I take plain, raw, old-fashioned oatmeal and grind it in a food processor until its texture is similar to flour. UPDATE: I’ve added 1/2 cup of shredded coconut cranberry almond muffins recipe, and it has turned out even more delicious! Don’t be afraid to experiment with your favorite ingredients! Can you substitute the sugar with another sweetener like molasses or honey? You can sub maple syrup and honey, 50/50, for all the sugar!